My wife thought that my last book review was a bit random in a blog that had focused so far on our personal journey! But my plan is to include diversity and focus on a range of issues. In particular, I’m keen to spotlight books on a range of topics that I believe will be helpful to others. As I’ve spent nearly all my working life as a church pastor, I hope to review a number of books on topics such as ministry, leadership, teamwork, theology, church and the like. 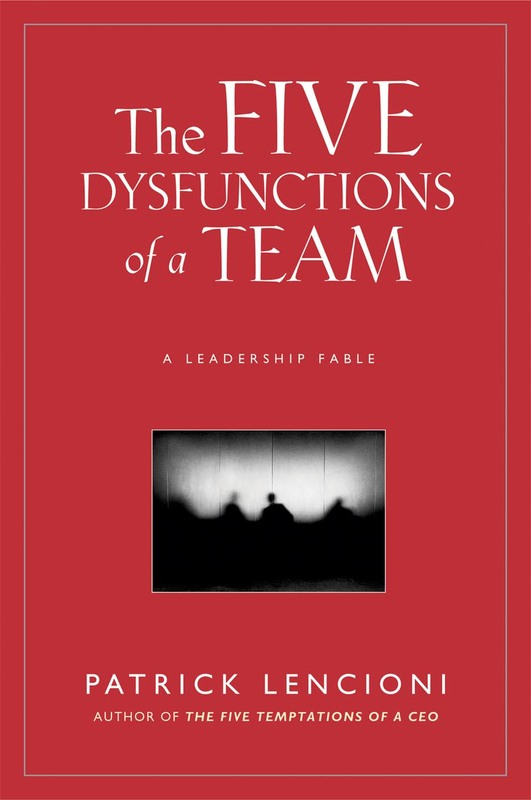 One of the most readable and helpful books I’ve found on the topic of teamwork is Patrick Lencioni’s The Five Dysfunctions of a Team: A leadership fable. I read the book cover to cover in one sitting at my favourite coffee shop. In fact, I remember wishing that all books were written like this one. Hook you in with a story, keep you wanting to know what happens next, develop the key points throughout the story, and then summarise the theory at the end. More importantly, I was hooked because I could see myself in the story. I could relate each of his points to our staff teamwork (or lack thereof). I knew that this was a book that I would keep buying and giving others to read. I got hold of a video of Lencioni teaching on the topic and we had a staff retreat to discuss our teamwork. I purchased the workbook and have used it in team contexts. I’ve given the book to rugby players and coaches, pastors, headmasters, CEOs and other team leaders. And I’ve recently ordered the Manga version! This occurs when team members are reluctant to be vulnerable with one another and are unwilling to admit their mistakes, weaknesses or needs for help. Without a certain comfort level among team members, a foundation of trust is impossible. Teams that are lacking on trust are incapable of engaging in unfiltered, passionate debate about key issues, causing situations where team conflict can easily turn into veiled discussions and back channel comments. In a work setting where team members do not openly air their opinions, inferior decisions are the result. When teams don’t commit to a clear plan of action, even the most focused and driven individuals hesitate to call their peers on actions and behaviors that may seem counterproductive to the overall good of the team. Team members naturally tend to put their own needs (ego, career development, recognition, etc.) ahead of the collective goals of the team when individuals aren’t held accountable. If a team has lost sight of the need for achievement, the business ultimately suffers. As our staff team explored these ideas together we recognised each of these dysfunctions in varying degrees. We wouldn’t have said that we lacked trust in each other, but the fact that we avoided conflict showed we did. We’d describe ourselves as a team, but in some ways we were functioning as a bunch of individuals who got together now and again. It would often take forever for us to make changes or implement ideas, and yet we’d claim to be focused on getting things done. This book has been around for a few years now and my guess is that many of you will have read it and found it helpful. But if you haven’t got into it, then let me give it a rap by sharing a few stories. A senior pastor friend was sharing with me about how his staff team was fragmented, with one person in particular only interested in his own agenda. Everyone was uncomfortable with the dynamic that had set in, but no one knew how to address it. I sent my friend a DVD of Lencioni speaking on this topic and a copy of the book. The team watched the video and it was like having a consultant critique the team, and highlight the dysfunctional behaviour. The book then offered a framework for moving forward. Another friend heads up an international software company. To describe the employees as a team is probably pushing it because the people don’t spend much physical time together. Some of them do, and a couple of them were creating chaos by refusing to communicate with each other. My friend was required to fly across to the other side of the world to resolve a spat between highly intelligent professional people who were refusing to talk with each other! So I gave him a copy of the book to read on the plane. He found it gave him a framework to tackle the issues and break the impasse. Sometime back we were interviewing people for a job as an associate pastor. I stressed that team work was important to us, and asked each applicant to take a look at the Five Dysfunctions and discuss them with me. I was determined to find a team player. One of the applicants seemed very unimpressed with the model and I chose not to offer him the job. Interestingly, he got another job, but quickly decided that he didn’t really want to be a part of that team and went off on his own. Our church is somewhat complicated. We have multiple congregations, various age-specific ministries, dozens of leaders, small groups, and a large staff team. Team work is vital. A challenge to us has always been engaging the staff and key leaders together in team work when the focus in on areas outside their direct responsibility. This book, and another by Lencioni called Silos, Politics, and Turf Wars, has been so helpful in drawing people together. It has reminded us that a win in the youth area is a win for the whole church. A struggle to ‘connect’ people into the church community has a direct bearing on every other area of church life. Everything is connected and you need a strong team to make it work. Lencioni kept pushing us to value each member of the team. Teamwork is something that ought to be a hallmark of a church, or a ministry staff. And yet sadly, many of us know too well the pain of relationship breakdowns, competition for resources, and clashes of vision and priorities (our church included). I recommend getting a dose of Lencioni! 24 … God has combined the members of the body and has given greater honour to the parts that lacked it, 25 so that there should be no division in the body, but that its parts should have equal concern for each other. 26 If one part suffers, every part suffers with it; if one part is honored, every part rejoices with it. Today is day 14 of my 3rd chemo cycle. The cycle starts with a day in hospital attached to a drip with nasty chemicals being pumped into the body. Then a roller coaster for the next 3 weeks, before you do it all over again. In theory, and based on previous cycles, I should be feeling pretty good and getting back into a semblance of normal life. But here is the problem – patterns, statistics, predictions, and even past experience, do not determine the future. I ‘should’ be out and about, busy with work, and getting back into some gentle exercise. Instead, I’m lying in bed (with a laptop) trying to get rid of a chest infection and praying it doesn’t develop into anything worse. In fact, the past couple of days have made me rather fearful – fearful that I would end up in hospital again with pneumonia, fearful that I might compromise the chemo, fearful that something worse might happen. We are being reminded again and again that only God knows what’s around the bend and he calls us to trust him. There is a Latin phrase, deo volente, or DV, which means ‘God willing’. In days gone by it was common for Christian people to use these words as they spoke of their plans. You don’t hear it much these days, but I’ve begun using it more and more as I appreciate that it is God who is working out his good plans and purposes. In fact, this whole experience of getting cancer has highlighted how much I am not in control of my life and circumstances. My life has been given to me by God. He calls me to make plans and to consider the circumstances and to do things wisely. But he also calls me to act with humility, to know that I belong to him, and that I can rely on him to do what is in my very best interests. Even when I would prefer things not to be happening! We’ve been learning this more and more. But does this mean that all our preparations last year were going against God’s will, that somehow we were being disobedient and straying off the path? No, I don’t believe so. 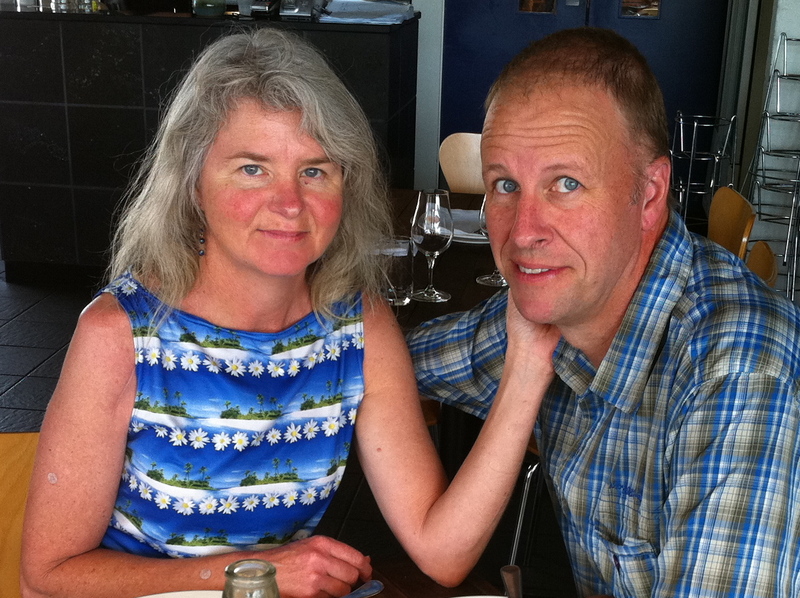 Our desire was to contribute to growing followers of Jesus in the Northern Territory. This desire was placed in our hearts by God and as we read the Bible we were reminded that this is pleasing to God. We sought wise council from many, and took years to come to our decision as a family. There was and is a big need, and we were drawn to respond. That need continues to exist and we pray that our passions to move north will be filled by others, or yet that I will be healed and one day serve God in that place, DV. So is it possible to see the hand of God in what has happened? Absolutely. God has been at work in our hearts and minds, moving us to depend upon him more deeply than ever before. He has encouraged us, and literally thousands of others to pray. He has raised questions in the minds of friends that have nudged them to consider what we believe about God. He has deepened our empathy and love for people suffering under similar and worse circumstances. He has used our words to encourage others far and wide in their own struggles. He has caused us to appreciate our family and friends and church all the more. He has reminded us to number our days. We can see God’s kindness in many of the details. My cancer was discovered because a doctor friend had the awareness to rush me to hospital when I complained of numbness and breathlessness. It was a time when all our family were at home. I had finished my final series of preaching at church. The church had already gone through a careful process of choosing my successor. It didn’t happen while we were on the road to Darwin. We still had our home in Canberra to move back into. Our friends have taken extraordinary care of us. Our church has continued to provide for us, and have welcomed my continued ministry among them. We’re receiving top shelf medical attention. I’m even allowed a tv in the bedroom! And there is so much more! Let me tell you about the weekend just gone. It was a special time for our family (only we missed Matt). 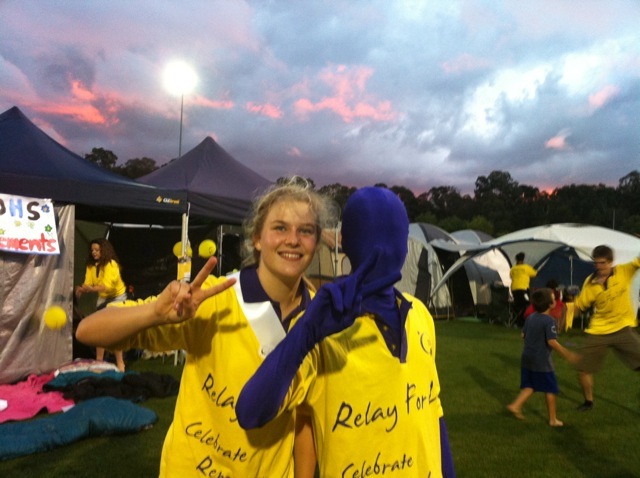 Fiona and Grace both entered large teams in the Cancer Council’s Relay for Life. 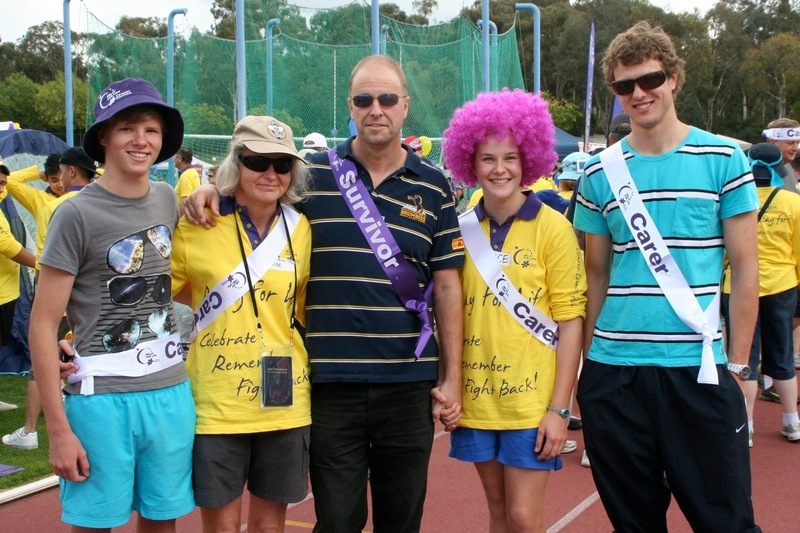 They set up camp at the AIS athletics track and walked for 24 hours to raise money and awareness for cancer research and support. I wasn’t that keen to go – who wants to be surrounded by people with cancer? But the relay had a carnival vibe about it, with music, dancing, stalls, fancy dress, and lots of people having fun in the sunshine (& rain). Some ran lap after lap, others walked as best they could. I did a few laps at different times of the day, and must have been the slowest walker on the track each time. The first lap was exclusively for people who had cancer (either now or previously) and for carers. I wore a sash saying ‘survivor’ and members of my family wore sashes saying ‘carer’. It seemed strange to wear the sash, as though I should’ve had to go into remission to ‘deserve’ it. But, I have cancer, I am alive – so I guess I’m a survivor! As we walked the lap it was very moving to be clapped by hundreds of people lining the track, including many friends in Grace and Fiona’s teams. I shed a few tears that I kept well hidden behind my sunglasses! I was glad that I’d gone along. We joined in another event on Saturday – a commissioning for friends of ours, Klaus and Judith and family, who are heading overseas. As we were making our plans to plant a church in Darwin, they were planning further afield in Germany. It was a thrill to share with them as they count down the days to leaving. Klaus is German, and it is his great passion for his kin to know the good news of eternal life. As one friend reminded me on later, we had two celebrations over the weekend – one of life here and now, and the other of life for all eternity. Our prayer is that people will value their lives here and now, but not so much as to ignore God’s wonderful invitation of life forever with him. Some people seem to think that Christian faith is ‘life-denying’. Our experience is the exact opposite. Jesus came so that we might have life in all its fulness – now and forever. Thank you again for your encouragement and support. The chemo roller coaster is a tough one, but made much easier in the knowledge that people are praying and helping us in so many ways. There is one cycle to go and we don’t know the plan after that. It could be more of the same, or part thereof. It could be something radically different. Our desire is for the treatment to completely destroy this cancer, and for us to be able to make new plans for a life beyond cancer, deo volente. As a church pastor, I can tell you there are few things more discouraging than complaints. We tend to feel under attack and immediately break into defence mode. “How dare they criticise my preaching!” “What would you know about the pressures of trying to organise and run a church? !” “They complain about us not being friendly, but they don’t make an effort!” “It’s not my fault!! !” Maybe we could do with a fresh perspective. A complaint is a gift, written by Janelle Barlow and Claus Moller, is a helpful challenge to rethink complaints. I read the first edition of this book over a decade ago and found it liberating and empowering. Since this time the forum for complaints has gone ballistic. A tweet, facebook comment, or blog post can destroy a product or business. Word-of-mouth can go viral, quickly becoming ‘world-of-mouth’ in a matter of minutes – just witness the current Koni video. The second edition of this book (2007) takes account of these kind of changes, incorporates ‘complaints’ and feedback from the first edition, brings us up to date, and introduces suggestions about how to make complaints, how not take them personally, and how to use the internet constructively. What is a complaint? Fundamentally, it is a statement about expectations that have not been met. But more importantly, it is an opportunity for the organisation, business, or church in our case, to make some helpful changes. This book calls upon us to redefine complaints as gifts. This will require us to separate the message from the medium. We must distance the content of the complaint from the emotion of being blamed. In other words, we shouldn’t take things so personally! This will mean gaining empathy for the disappointed people and rethinking how complaints can help us to move forward as a church. The very fact that they made the effort to complain indicates some level of commitment to us. Many will only grumble to others or simply walk away. We’d do well to put ourselves in their shoes. Imagine that what they are complaining about had happened to you. How would you react? What would need to happen for you to be satisfied? This book warns against a strategy of reducing the number of complaints. Complaints can be avoided by closing down lines of communication. But all this does is bury problems and maintain the poor state of affairs. Instead, we need to create opportunities for feedback. We can do surveys from time to time, but they will never adequately reflect the levels of dissatisfaction. Such people are unlikely to wait for the next survey to air their complaints. Maybe they’ve already walked away in frustration. Churches, like businesses, depend heavily on word-of-mouth advertising. The way we handle complaints will work for or against us. People are much more likely to believe a friendly recommendation than formal advertising. If we handle complaints well it can be a powerful source of positive word-of-mouth. On the other hand, the more dissatisfied people become, the more likely they are to spread bad news. I couldn’t tell you many times we’ve had people turn up at our church, saying things like “I used to go to… but I left there because…” And I’m sure there are plenty who’ve left our church, headed elsewhere, and told a similar story. So much movement and pain could probably have been avoided if we’d done a better job of listening to complaints. While written with the business sector in mind, this book has value to a much wider audience. The issues raised are relevant for personal relationships, resolving conflict, and improving communication. At a time when people are craving connection, pleading to be heard and understood, churches and their leaders would do well to take notice. While some will read the book and be motivated by the desire to increase profits, pastors should read it with a regard to people’s souls. 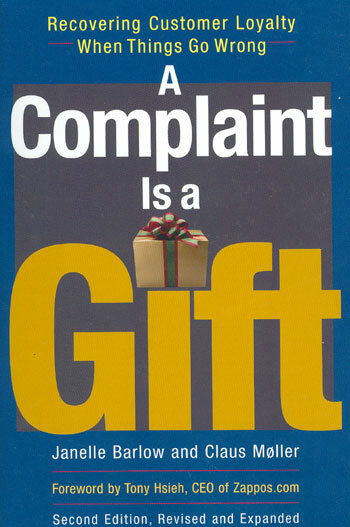 A complaint is a gift (2nd ed.) is divided into three parts. The first part, Complaints: Lifeline to the customer, examines the strategy for developing a positive mindset toward those who complain. It helps us to understand what is going on when someone complains, and how they are likely to respond when they are not satisfied. Explain why you appreciate the complaint. Promise to do something about the problem immediately. Correct the mistake – promptly. The final part, Dishing it out and taking it in: the personal side of complaints, is new to this edition. It is a helpful addition, broadening the scope and value of this way of thinking into other areas of life. There is good stuff here for strengthening marriages and other personal relationships. This is probably not a book that many church leaders would think to add to their libraries. You probably wouldn’t buy it to help resolve conflict with your neighbour or a work colleague. I doubt you’d be impressed if I recommended it for strengthening your relationships with your spouse or children. However, this book offers practical help for all these scenarios. Author macarismsPosted on March 15, 2012 April 11, 2012 Categories Journey with Cancer, RelationshipsTags suffering11 Comments on High points of marriage? The truth is, this way of thinking is a lie and a trap. Always has been. I know that I’m not the sum total of my upbringing, career choices, sporting successes, travels, relationships, accumulated possessions or circumstances. My significance can’t be measured by wealth, or wisdom, or health, or the lack thereof. I believe God has made me for a purpose. Not to wallow in self-pity or be puffed up with pride, but to look outwards to others, to consider others more important than myself, and to put other’s needs before my own. God has shown me how to do that, in Jesus who had everything but incredibly sacrificed it all for you and me. It’s not easy, but please God, help me to remember that it’s not about me. It seems winter has come early this year! 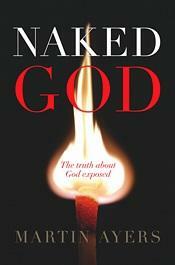 I spent most of yesterday in front of our open fire reading Martin Ayers’ book Naked God. I’d had a few people recommend it, and I’ve been on the lookout for good books to give friends who are interested in finding out more about what genuine Christianity is all about. I found this a very readable and helpful book, and enjoyed reading it in a couple of sittings. If you are keen to begin exploring Christianity, without getting lost or distracted by all the junk that often gets added, then this book is a good starting point. In his famous book and TV series, The Naked Chef, it wasn’t Jamie Oliver who was naked, it was the food. Jamie Oliver succeeded in stripping down the food to its bare but glorious essentials. And that’s what we need to do with God. We need to look at the evidence and find out what it uncovers. We need to strip away any false ideas we’ve developed from our culture or background, and reveal the truth. This is the truth about God, exposed. This is Naked God. Martin Ayers begins by arguing a case for why the God question really matters at all. He does this by first considering the alternative – a world where there is no God – and what this means for our day to day lives. He probes the implications for meaning, purpose, freedom, morality, life and death. In the first part of the book he explores where atheism leads, drawing upon some of the claims of Richard Dawkins and others. His aim here is not to prove whether atheism is true or not, but simply to highlight the real implications of holding to this view of the world and the difficulties associated with seeking to live with a consistently ‘naturalistic’ way of life. The second part of Naked God focuses heavily on the historical person of Jesus. He defends this approach by highlighting the extraordinary life, teaching, and impact of Jesus. This focuses ultimately on Jesus’ unique claims to be, quite literally, God among us. His untimely death at a young age by crucifixion, and the claims by his followers that he had been raised from death, are shown to be the linchpin in understanding Jesus and his relevance for us. In doing this, he tackles problems people may have with the reliability of the New Testament, the transmission of manuscripts, and the claims to uniqueness over against other world religions. While this is a relatively brief book, the arguments are well made and references to more substantial works are offered to the serious researcher. Ayers also addresses the ‘gut reactions’ many have against Christianity, such as its perceived social regressiveness, or the taking away of personal freedom, or the appalling track record of many who claim to be followers of Jesus. The final section of the book speaks to the reader in a more personal way. Ayers explores the barriers we have to really knowing God. Importantly, he demonstrates that religious self-righteousness is just as big a blockage to relating to God as the choice by many to ignore God and shut him out of their lives. However, the book takes us beyond the problems and difficulties that stand in the way of knowing God, and invites us to take hold of what God is offering. And this is a genuine personal relationship with the One who made us. This relationship is shown to be a step into reality, not an escape into wishful thinking or myths and legends. It makes a big difference to life now, and beyond the shadows of death into eternity. 1. We are so aware that it is your prayers that are continuing to sustain us in relatively good spirits and in complete confidence in God. Taking David to chemo was one of the hardest things I’ve ever done – like taking the kids for vaccination, but far worse. You know it’s good for them, but the pain inflicted! We understand those who go into denial. It would have been so much nicer to have stayed on holidays at Burrill Pines. We loved being there for our few days as we find it one of God’s most beautiful peaceful places on the south coast. Taking him 3 weeks later for the second time was no easier, knowing from experience, not just fear, what lay ahead. It doesn’t sound that bad: he sits in a chair for five hours while they put bags of fluids into his arm. First time he watched movies, second time he had a chat with his neighbour. For the first 24 hours he feels okay. After that he starts feeling poisoned, which he has been. Without going into graphic detail, it messes up his stomach, gives him headaches, skin rashes, aches, fatigue and more, making him feel like he’s got a bad dose of the flu with trouble sleeping. By day 10 he’s starting to feel less toxic, and starts regaining the weight he’s lost. Friends have been tempting him with all sorts of treats: ginger beer, coffee, chocolate slice, chinese herbs and acupuncture, ‘words with friends’, walks, books to read, movies to watch, sermons to listen to, good conversation. When he’s sick, we feel like we’re holding our breath, wondering if this poisoning is worth it. When he starts feeling better, and starts doing more, it’s hard to believe he’s got cancer, except when there’s an abrupt reminder because of pain, or blood test, scan due, visit to oncologist etc. Today he’s preparing a sermon for this Sunday – a commissioning service for Marcus that had been planned for December last year! But next Thursday preparing a sermon will be an impossibility, as the chemo cycle starts again. Monday he had a progress scan. After 6 weeks of holding our breath – no wonder I was looking blue and feeling dizzy – the scan has shown that the tumour has shrunk from 26 mm to 18mm (such a small, little nasty). After visiting our oncologist today, it means we continue with this particular course of standard chemotherapy (carboplatinum, alimpta, avastin for those who want to know – the latter two being current state of the art treatment) for another two cycles of one day on a drip every three weeks. We’ll then have another progress scan, and consider our maintenance options. We asked you early on pray that David might have one of 2 receptors. The EGFR, which is now routinely tested for, was negative. It was always unlikely because it is most prevalent in younger Asian women. But we have discovered David is ALK positive! (And thank God we asked for this to be tested because it’s not routine to test). This is a rare (3-5%) genetic mutation that is the driver behind David’s cancer, ie. causing the cells to grow out of control. Just why this ALK gene has flipped itself upside down and fused where it shouldn’t have, is still not yet known. This mutation was only discovered in 2007 and is still under investigation. There are new drugs, still being tested which aim to turn this driver off, which have been showing some very positive results since they first started trialling it in 2008. They’re up to phase 3 of the trials now, answering the very questions that we’re asking: which treatment is more effective? Unfortunately we were not able to be included in this trial, but our treatment is very similar and will allow us to, hopefully, use the new drug Crizotinib to kick the driver out when David’s cancer stops responding to the standard chemotherapy. For those who want to understand more fully than this simple explanation see a link sent by a kind oncologist in Melbourne. He’s the Aussie speaking in the video. And just praise God with us for scientists who are so clever! I’ve always agreed with whoever said that science was thinking God’s thoughts after Him. It must be so exciting to be on the cutting edge of science like this and hopeful for us being potentially on the cutting edge of new designer drugs. All this means, God willing, that though not medically curable, David’s cancer might be able to be managed for significantly longer than we were previously given hope for. We’ve been inspired by stories on a cancer forum of the survival of those on Crizotinib and the more normal lifestyle that can be lived. Praise God for this hope and pray it is realised: longer life for His glory, as described in Phil 1: 19-26 (and take note of the challenge to you, dear reader of verses 27-30.) We’ve enjoyed reading Philippians as a family recently. 1:21 points out the win/win situation we find ourselves in; 2: 1-11 has been the inspiration for my life; 2:14 is a great verse to quote to squabbling kids; Phil 3:7-14 is inspirational for our circumstances now; and 4:4-8 continues to be a great source of challenge and comfort. The peace I feel can only be the precious gift of God to me in this time, in answer to your prayers. We’ve also enjoyed reading some good books: ‘Suffering Well’ by Paul Grimmond helps us reflect on where is God in all this, and ‘Naked God’ by Martin Ayers is a good read for sceptics. But we also hurt for those around us who’re also suffering. There are a number of close friends with medical conditions, whom we pray for regularly. We’d like to encourage you to think about who you know that might be struggling with serious illness, and uphold them to God. Please also pray for David, for opportunities David has to share his faith and hope. Pray that we will continue to serve our church family in their grief and joys. And pray for me as I seek to care for my patients, in their sickness and the trials of life. We are so thankful to our church, Crossroads, for their care for us. David had the opportunity to speak for 15 mins or so at a special church family meeting on Monday night. He shared his appreciation of being able to serve the church as senior pastor these past 16 year. He thanked many whom he’d worked with. He shared of the shock and heartache of being diagnosed with cancer, the time in hospital, the struggles, facing his own mortality and more. The pastoral staff and the elders specifically prayed for David to be healed and to honour God with his life. David has also been welcomed to continue serving in ministry at Crossroads as he is able. He is excited to be able to speak this weekend. Obviously he is going through a bit of an identity crisis (not too badly!) as his life has been so focused on ministry leadership for so long. He has been thinking of writing a blog or something, but hasn’t got anything off the ground yet. [My letters are getting it launched for him!] The Brumbies have also welcomed David back as team chaplain. They have been very supportive of David and our family over the past 3 months, and it was great to be able to go to a game together again last week. Jake White has welcomed David’s involvement with the team and he is hoping to have a positive impact on the lives of many. He had the opportunity to share with the whole squad recently. Our children continue to be an amazing source of joy and encouragement. Their visits and calls. The joy of conversation and praying together. Their sports, musicals, friends, youth group, activities, and their faith and struggles. 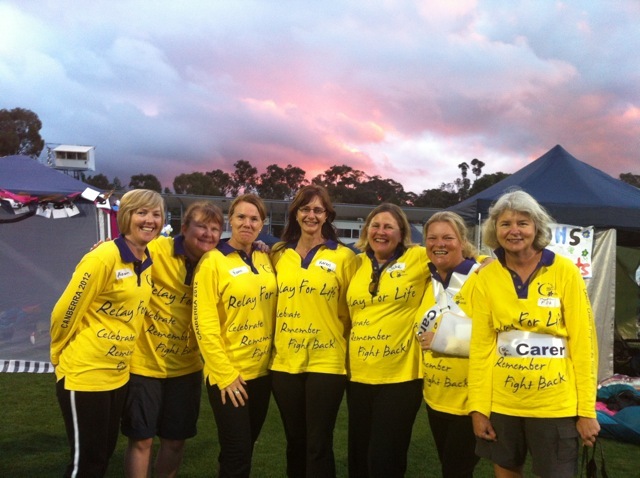 Even organising a team of teenagers to raise money for cancer research through the Cancer Council “Relay for Life”. Thank you all for your love, and remember God loves you more than you could ever imagine.